This is an announcement. Scroll down for newer posts. The Four Horsemen, who just unveiled their new website, will soon be announcing their Kickstarter campaign for the Gothitropolis Ravens (sounds like a very weird football team). To get ready for the event, the Four Horsemen have agreed to answer a few questions. I’m going to submit five questions specific to the Kickstarter project, and five questions about anything else you want to ask about. So post your questions in the comments and I’ll pick ten of them. If the Kickstarter for the Ravens works out, would they consider using a similar selling platform for Symbiotec? Good question. I was going to ask if Symbiotech was dead. That was going to be my question as well. How likely is it for a re-release or a newly colored/variant release of any past Seventh Kingdom figures? 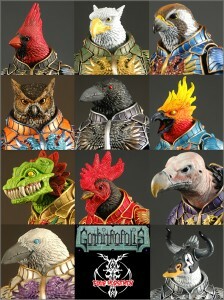 For example, an albino version of the Rhino/Elephant figure or a female warrior with new bird head/feet. Definitely this. I just want a real shot at getting Xetheus and his Minotaur buddies. As a follow up question, if the tooling still exists, would it be possible to get some new variants out of the old base bodies? New head sculpts for the Xethus body (ala He-Mikes incredible customs) or new mutant variants etc? For the kickstarter, will the variants only be available at higher donation levels, or will there be an opportunity to, say, just pick one or two versions of the mold? Can they try to do more human (or humanoid) characters in their home-brew lines? Since both Queen Alluxandra and Vampire Lady won fan favorite contests, I expected that there would be several humanoid variants among them. Instead the variants were mostly used to create more anthropomorphic characters (which are already overexposed between 7th Kingdom and Gothotropolis) or characters too far removed from humanness, like Ccora and Kromius. I think we all would like to have seen a least a couple of more beautiful femme fatales, ala Isadorra. Ok, nix the part about AQ and VL winning contests. My question still stands though. neither Alluxandra nor the Vampire Lady won anything actually, the guys wanted to make them so they made them, but neither ever even placed in the Fan Ex contests to the best of my knowledge. as for my question, is there any chance that Minotaur The Duck can be officially placed in the 7th Kingdom mythos or will he be in Goth as he is technically another raven? What extent will the Power Lords have glyos joints and what extent will they have traditional joints? Sorry if it's something asked before, but have they ever considered doing any diorama-type display products to go with the various lines they've produced over the years? What will the definite price be for each Raven figure? What vintage toyline or cartoon series would you like to create action figures for that you haven't already gotten to do? 2> Kickstarter: Man i can't wait for this. Will they have a complete set of the Ravens just like they did for Scarabus, and will the folks ordering a complete set get somethign small as a bonus ? Since the design work and sculpting work (presumably the most time-intensive work?) has been completed already, how long after the Kickstarter campaign is successfully funded will it be before the figures are actually in production? How long does it take to actually tool the molds and get production going from here? Whwn are we going to see Terra Firma? ….and when will I learn to use the spellchecker? I missed that entirely! nice one! But I'd prefer the (standard?) infinity edition. These might be the ones to get me into more of the line – they are very nice! After the Raven kickstarter project runs its course, how soon thereafter might we see another fan-ex vote for newly designed characters? Super excited for the ravens and the kickstarter. 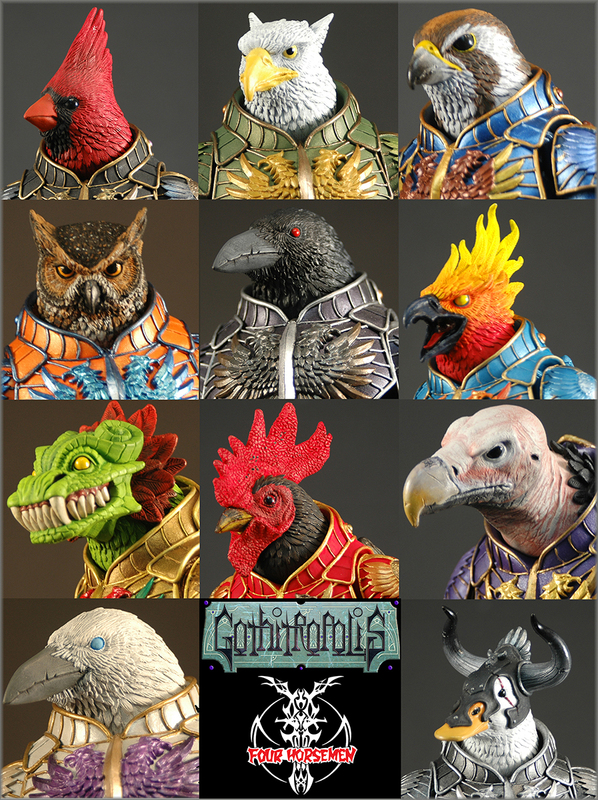 Question: love all the 7th kingdom and gothtropolis figures so far, but is there any chance/desire/designs for any robot characters in the near future? I want a horsemen-styled bot, dammit. Which as yet unmade DC character would they love to produce? Is there any figure they wish they could go back to the drawing board with?